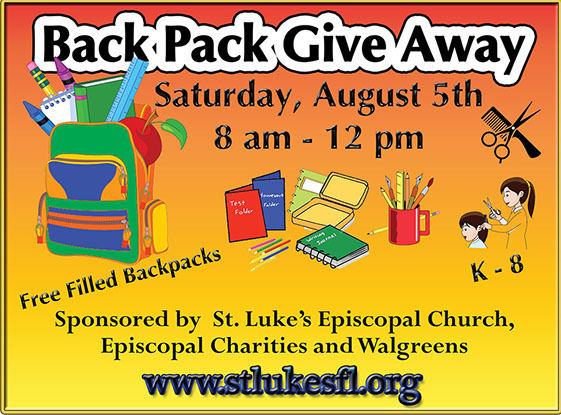 The 13th annual “Back to School Event” at St. Luke’s Episcopal Church, Cove Road at Old Dixie Highway, Port Salerno, will be Saturday, Aug. 5 at 8 a.m. We will have 600 filled backpacks to give away, dental supplies, a book to read, a package of new socks for each child. We also will offer snacks and free haircuts. Contents of the backpacks are determined from a list of needed supplies that schools send out for each grade. Each backpack has a value of about $25. Our “Sponsor a Child” program collects donations of $20 from January to July from anyone willing to give. The sponsors of this program include St Luke’s, Walgreens and Episcopal Charities of Southeast Florida and local dentists. Our thrift store also participates with a major sale event that day. Also that day information on safety from the police and fire departments will be distributed. For more information on the “Back to School Event,” donations or to volunteer, call St. Luke’s at 772-286-5455 or Vicki Zambardino at 772-221-8345.